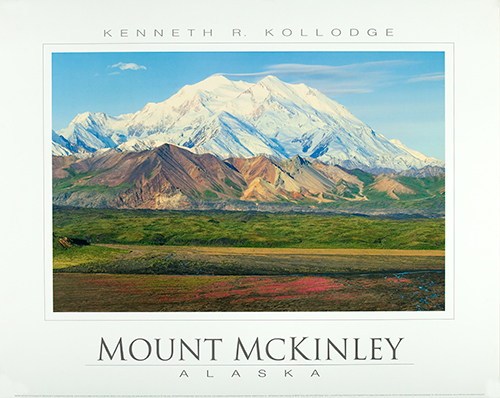 This image of Mount McKinley was made with a 4×5 inch view camera from about 2 miles west of Eielson Visitors Center in Denali National Park, Alaska about 9:00 AM in July. I had qualified for a permit to drive the park road as a pro photographer and we were camping at Teklanika Campground. We left the campground about 4:00 in the morning in order to get to this spot without knowing whether the mountain was visible. Mount McKinley is the tallest mountain in North America at 20,320 feet, is visible only 20-25% of the time and I’m about 30 miles from the mountain while making this image. I used this image as part of my application to earn a road permit the next year and the chief ranger put a personal note on my approval saying this was his all-time favorite picture of Mount McKinley. Makes a guy feel pretty good!